Renowned Chinese American writer Pai Hsien-Yung has been an avid promoter of Kunqu opera for years. The youth version of Kunqu opera classic “Peony Pavilion” that Pai initiated and adapted has been a sensation in colleges across China, for some thirteen years. He even opened a class at Peking University to pass on his passion toward the art form to young students. Lately, Pai has revisited Peking University to bring the re-adaptation of another Kunqu opera classic to the campus. Pai hopes the staging of this show could be part of a revival of traditional Chinese culture among younger audiences. Crowds of students came to watch the show’s debut at Peking University. “White Silk Gown” is the second collaboration between Pai Hsien Yung and the Suzhou Kunqu Opera Theater, with the first one being “Peony Pavilion”, which turned out to be immensely popular. Eighty-year-old Pai Hsien Yung hopes the new show will once again rejuvenate young students’ interest in the pearl of Chinese operatic art. "As a project sponsored by a national art fund, this new version “White Silk Gown” took three years to make. From honing the scripts, to costume designs, to the rehearsals.... we’ve kept the essence of the original classic," said Cai Shaohua, director of Suzhou Kunqu Opera Troupe. "White Silk Gown" was adapted from a Qing dynasty novel and tells of a heart wrenching tragedy. Scholar Xu Jizu becomes an official after taking the country’s imperial examination. From a mysterious old woman, he gets a white silk gown, which is a hint of his own fate. At that point, he learns that his real father was killed by a bandit leader who looted his mother thereafter. Then he gets a lawsuit from a guy named Su Yun, who actually is his father and survived the murder and concealed his name for years. And the man Su is suing is the man he has taken as his real father. He abducted him and raised him as his own son. So Xu Jizu then faces the torture between righteousness and his emotional bond towards his "step" father. "White Silk Gown" was adapted from a Qing dynasty novel and tells of a heart wrenching tragedy. The original version of the opera had the protaganist sentence his stepfather to death and had him executed. In this new version, the stepfather commits suicide, to highlight the inner struggle of both the protagonist and his "stepfather". 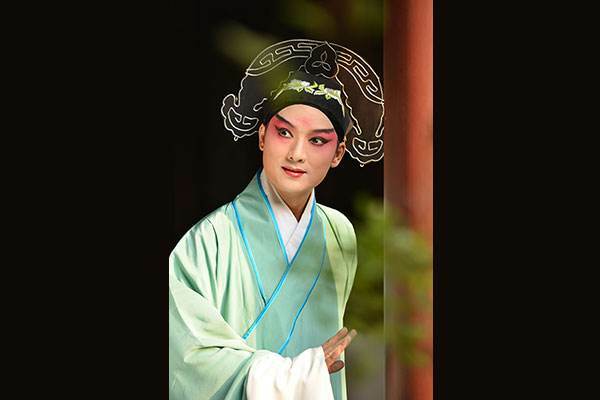 Pai says choosing this piece to be adapted, is to show modern audiences that Kunqu opera both excels at delivering a love story and a serious theme. "I’ve been thinking a college campus tour starting from Peking University is a good way to promote Kunqu opera. I hope White Silk Gown can once again arouse interest from young students just like Peony Pavilion," Pai said. As the oldest form of Chinese folk opera, the 600-year-old Kunqu Opera was listed as one of the world's "masterpieces of oral and intangible heritage" by UNESCO in 2001. The art form reached its heyday in the 18th century and then waned to the verge of extinction in recent decades. For three years following the UNESCO recognition, Pai, a Kunqu opera fan himself, used his personal social relations to enroll talents and raise funds for the making of the new version of "Peony Pavilion". He gathered directors, costume and stage design artists from both the mainland, Taiwan and Hong Kong, to cooperate with the Suzhou Kunqu Opera Theater for the project. He raised some 30-million yuan and put all of it into the creation. The youth version of “Peony Pavilion” debuted in Taiwan in April 2004 to great acclaim from audiences. The show became a hit, being sought after by distributors. But Pai didn’t choose commercial performances to enlarge the show’s popularity. Rather, he brought it to college campuses, to treat students at low prices. "I wanted to nurture a large amount of college students, to let them learn about Kunqu, fall in love with Kunqu and be drawn closer to our traditional culture," Pai said. Since it debuted at Peking University in September 2004, the youth version of “Peony Pavilion” has sailed into more than 30 colleges around the world. It has won over a lot of student fans during the past 13 years. "I feel very pleased to see such a huge number of young audiences falling in love with Kunqu because of the single show. Although it was very hard during the whole process, all the hard work paid off. It was very worthwhile," said Pai. Pai didn’t stop with recreating Kunqu classics. He initiated a plan to bring Kunqu to the classroom. The plan, called “Pai Hsien-Yung Inheritance Plan of Kunqu at Peking University” was launched in 2009. He not only taught students how to appreciate the art form in class, he also invited performers to tutor students on their singing and postures. This time around, he has also brought the production crew to meet the students. When it comes to why he thinks Kunqu is a beautiful art, he has this to say. "Kunqu is extremely beautiful. As literature, it has the most beautiful poems and proses in its scripts. As dance, it has very elegant postures. As music, it is very touching. And its stage art and costumes are also very beautiful. I think it is an art form that uses the most beautiful form to present the deepest emotions of Chinese," he said. Being the son of famous Kuomintang general Bai Chung-hsi, and an established writer whose credits include many best-selling novels, Pai now calls himself a volunteer promoting Kunqu. Born in Guilin, in south China's Guangxi province, Pai moved with his family to Chongqing, Shanghai, Nanjing and later to Taiwan. He finished high school in Hong Kong, received his college education in Taiwan, and got an MA from the University of Iowa in the United States. He was also a professor at UC Santa Barbara for decades. Despite a drifting life, if asked where his hometown is, Pai says traditional Chinese culture is his hometown. And he believes the part of traditional Chinese culture that he feels affection for, should be passed on.